Patio enclosures make excellent investments for homeowners in Hilton Head, South Carolina, where the weather is warm and inviting for much of the year. Not only do these enclosures bring the outdoors in, allowing homeowners to enjoy the beautiful scenery and weather without the drawbacks, such as pesky insects, but they also expand the usable space of a home. You can use an enclosure for everything from a home gym or office to a space to entertain your family and friends. For more than 25 years, Porch Outfitters has been the outdoor living company that homeowners in Hilton Head have trusted to build beautiful, long-lasting patio enclosures. We offer a variety of solutions to meet the needs of virtually any homeowner. For example, we build sunrooms from the respected manufacturer TEMO in a wide variety of styles with premium roofing systems and glass walls to let in plenty of natural light. We also build custom screen and pool enclosures to work perfectly with your outdoor space. And, all of our outdoor living spaces are constructed of the finest materials to ensure they will last long into the future and require minimal maintenance. At Porch Outfitters, we use our own team of highly trained and experienced installers – not subcontractors – to install our outdoor living spaces. This ensures that all projects meet our high standards for quality craftsmanship and that our customers absolutely love their new spaces. We even provide an unbeatable lifetime workmanship warranty to provide our customers with the ultimate protection for their investment. 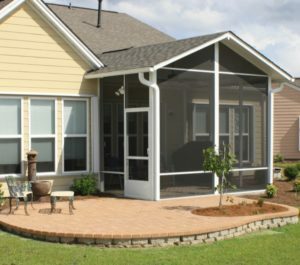 Contact Porch Outfitters to learn more about the patio enclosures we build for homeowners in Hilton Head, SC.